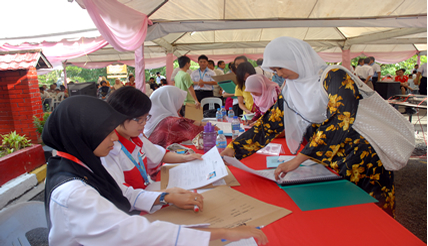 Bangi, 6 July 2010 – University Kebangsaan Malaysia (UKM) aims at having a fifty fifty ratio of undergraduate to graduate students intake by 2015 to live up to its status as a research university, said its Vice Chancellor, Prof Tan Sri Dato’ Sharifah Hapsah Syed Hasan Sahabudin. In a move to meet that objective it has this year reduced its intake of undergraduates by 10% compared to last year by registering a total of 3635 students. They include 85 international students. She told a press conference after mingling with the new students and their parents on Sunday (July 4) at the campus here, that this was to allow increases in the number of graduate students intake so as to produce more experts especially in the field of science and technology. UKM had made adjustments to its various programmes offered by reducing intakes in the field of social sciences. There was, however, no reduction in intakes of undergraduates for the medical, health sciences and engineering. Prof Sharifah Hapsah said this was the formula applied in UKM to allow more experts to be produced especially in the fields of science and technology. Sunday was the new students’ first day in campus. They came from all walks of lives and from all the regions of the country. A myriad of expressions were obvious on their faces, some with nervousness at their new surroundings while others were clearly excited as they take their first steps into the world of academia. But they all have one thing in common; all of them are selected from thousands of others who applied to become students. UKM, like other public universities, is also experiencing the trend of registering more female students though this year there was a slight increase in the percentage of male students at 32 % against only 30% last year. It was no doubt an auspicious day for the 3635 new students, but only some knew exactly what they want to do after graduating. The Vice Chancellor said that school counselors should play a role in helping students choose the area of studies they want to pursue. “Sometimes they applied for medical or health studies and may be offered to do Information Technology instead. But this is still in the science group. I think school counselors can play their part to guide their students apply for places in the universities. They must know what they are applying for and the careers prospects. Thus the school counselors must be more aware of the courses offered so they can advise their students on the courses to choose and apply for,” she said. The registration day went on smoothly without a glitch with some nostalgic scenes seeing some student kissing their parents hands and asking for their blessing. But not all students have their parents with them sharing their happy moments. One such student is Hirza Ahmadi an Economics student on an Indonesia government scholarship. “I was suggested to study in UKM and I am excited to be here. I hope I can fit in with the new environment,” said Hirza. Another student from Penang, Amirul Ahmad who listed UKM as his first choice when he applied said: “I am very grateful to be selected to study here, firstly the environment and secondly, I think it is one of the best universities in the country,” said Amirul a Mass Communication student. The students will undergo various programmes specially designed to make them feel at home and to get use to campus life.